Very few things are more disgusting than ticks. 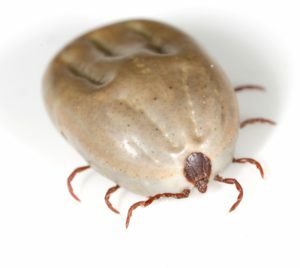 Even if you don’t account for their skin crawling abilities, ticks can cause a variety of illnesses spread by their blood-sucking habits. Lyme disease is one of the more common tick borne diseases we see in veterinary medicine. It is caused by bacteria known as Borrelia burgdorferi which can live in ticks. In the Midwest, Deer ticks are the more common culprits of spreading Lyme disease. When you find a tick on your pet, who knows how long it’s been there! Ticks can spread Lyme disease after being attached to your pet for 24-48 hours, which is why tick prevention is so critical. Lyme is a zoonotic disease (affects both animals and humans), but the disease is very different between people and pets. It can also be difficult to detect. Most pets never develop symptoms of Lyme disease, and we may diagnose it incidentally during an annual exam. If pets do develop symptoms, clinical signs normally do not appear right away after a known tick attachment, but can occur months later. The most common symptoms of Lyme disease in pets are sudden joint pain resulting in lameness in one or more joints. These signs may resolve on their own. However, it is not uncommon for these signs to recur later in life. Rarely, Lyme disease can also result in acute kidney failure in pets. Lyme disease can also result in long term health issues with the joints, heart, and kidneys. Nervous system complications have also been reported. A thorough history, medical exam, and diagnostic testing will help diagnose Lyme disease. Lyme is usually diagnosed by SNAP tests, which are quick blood tests performed in the clinic, used to test for heartworm disease, Lyme disease, and 2-3 other tick borne diseases (Ehrlichia and Anaplasmosis) depending on the type of test used. Tests that are positive for Lyme disease may require additional testing to help the veterinarian recommend treatment options. Antibiotics and pain relief medications are the usual recommended methods of treatment. It is important to follow up with your veterinarian and monitor your pet because relapses are common. Prevention is always better than treatment. Lyme is endemic in certain areas of the country, including this region of MN/WI/IA, however dogs in almost all areas of the country are at risk. Even dogs that are on a solid tick preventative routine are still at risk. Owners are advised to avoid wooded, grassy, and sandy areas where ticks are known to live. It is recommended to keep lawns well maintained and shrubbery to a minimum. Annual Lyme vaccines are also available for dogs that are at risk. We can help assess your dog’s risk level and determine if the Lyme vaccination is right for your dog. Remember, prevention is two- fold with both year-round prevention and vaccination; both are needed for more complete protection. We offer various products from chewables to topicals to help prevent fleas and ticks. Let us help you decide what is right for you and your pet. Contact us today at 563-285-7891.